PINE BLUFF, Ark. – Arkansas is home to two kinds of armyworms – true armyworms and fall armyworms. During their last two stages of growth, they eat tremendous amounts of grass so scouting pastures for armyworms is essential, says Dr. David Fernandez, Cooperative Extension Program livestock specialist at the University of Arkansas at Pine Bluff. True armyworms are usually a springtime pest, especially in northern Arkansas on cool season grasses. But they can also be a problem in southern Arkansas. Fall armyworms are more common in southern Arkansas, and they appear in midsummer especially in bermudagrass pastures, he says. Armyworms easily avoid detection by the casual observer which is one reason damage seems to appear overnight. True armyworms eat at night so their damage is especially noticeable in the morning. Armyworm damage looks like brown drought damage because of dehydration from the leaves of the damaged grass. You will also find frass, which are small, dark seed-like caterpillar droppings. “The best time to check for true armyworms is at night and for fall armyworms early in the morning or in the late afternoon when they feed,” says Dr. Fernandez. Otherwise, you’ll have to get on your hands and knees and look under the thatch to find them where they rest during the day. “Just because farmers and ranchers find signs of armyworms doesn’t mean they need to spray,” says Dr. Fernandez. 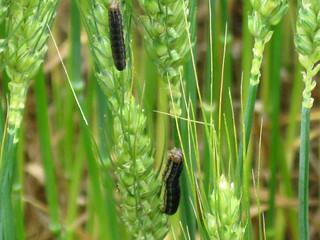 Armyworms have many predators and diseases that kill them. It is not uncommon to scout pastures one day and find many caterpillars and then be unable to find any a couple of days later. Deciding when to spray requires sampling. Dr. Fernandez offers these tips on sampling for armyworms. Make a 1 square foot sampling device from some PVC pipe and PVC elbows. Take at least 10 random samples from across your pastures by throwing it (not too far so you can find it easily) on the ground. Get down on the ground, and carefully count the number of caterpillars you find. Remember to look under leaves and thatch. If you find three or more caterpillars a half-inch long, treat your pastures. If the caterpillars are smaller, treatment is not necessary as their natural enemies may control them. But, producers should continue scouting because if natural predators do not control the armyworms, they could do lots of damage, advises Dr. Fernandez. If hay is ready to cut and bale, avoid spraying by baling, advises Dr. Fernandez. Larger caterpillars over 1.5 inches have already done most of the damage they will do so spraying won’t help and will cost money. For more information on controlling armyworms in pastures, see Extension fact sheet FSA 7083 “Managing Armyworms in Pastures and Hayfields” http://www.uaex.edu/publications/PDF/FSA-7083.pdf or contact Dr. Fernandez at (870) 575-7214.